Jomar, a global manufacturer of injection blowmolding (IBM) machinery for the pharmaceutical, healthcare, personal care, beauty, food and beverage, and household products industries, will introduce an expanded portfolio of its IntelliDrive series of next-generation IBM machines at NPE2018. The machines, incorporating a unique servo-driven hydraulic system, will be featured in booth S12077. 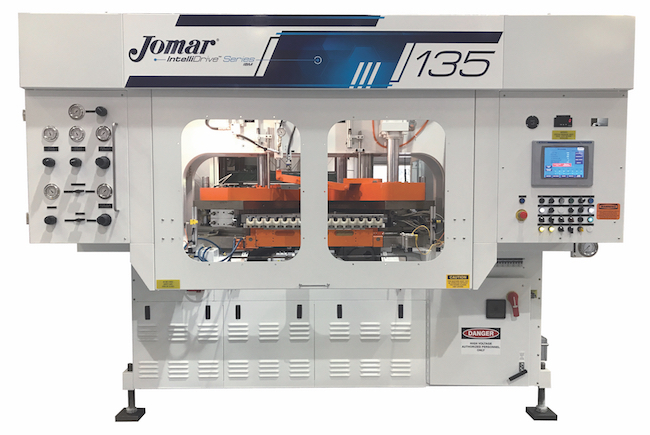 Jomar’s new IntelliDrive 135 and IntelliDrive 175, with 135- and 175-ton clamps, respectively, reportedly deliver major improvements in energy consumption, output and performance while maintaining the machine’s footprint. The launch has resulted in the conversion of Jomar’s large machine line to IntelliDrive technology and a discontinuation of its standard hydraulic Model 175. “These changes reflect the confidence we have in the capabilities of our innovative IntelliDrive technology and the level of energy savings that our customers are realizing,” said Ron Gabriele, Sales Manager. The Jomar IntelliDrive series, which also includes the IntelliDrive 85S that debuted at K 2016, features precise servo-driven hydraulics that reduce energy consumption by up to 50% compared with standard hydraulic machines, depending on container specification and material process. Jomar engineers worked in partnership with Bosch Rexroth to develop proprietary servo-driven hydraulic technology to power the plastifier. Both the model 135 and 175 boast a dry cycle time of 2.5 seconds, compared to 3 seconds for competitive IBM machines. They consume 40% less hydraulic oil and tower water and emit substantially less ambient heat compared with standard hydraulic machines, which reduces overall operating costs. Along with lower energy and utility costs, the IntelliDrive series offers a reinforced main platen that reduces the possibility of deflection. The machines also feature a closed-loop clamping system, which delivers exact control over the clamp’s speed and position. 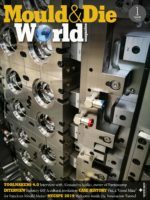 This creates faster speeds for opening and closing while simultaneously reducing impact on tooling, thus prolonging the life of the molds.